The Kendal FBD2535 is a great choice for those who are looking for a spa massager for home use. Capable of delivering a wide array of therapies, such as heating therapy, massage with oxygen bubbles, water wave massage and water fall massage, this device can successfully replace expensive visits to the spa and helps you achieve the relaxation you need for your tired feet in the comfort of your own home. Created by a company specialized in making home spa products, the Kendal FBD2535 combines the benefits of the most important therapies for foot massage. 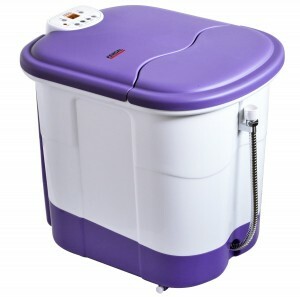 One of the characteristics of this spa bath massager is that it is very deep, and therefore will massage not only your feet, but your calves, as well. Since the muscles in the feet and the calves are greatly affected especially when we sit long hours on chairs or in other static positions, they need to be stimulated so that blood circulation can be improved. Another feature found on this spa massager is the ability to adjust the temperature between 20 and 48 degrees Celsius, since some people prefer their water to be hotter, while others do not mind lukewarm water for employing various water therapies for their feet and calves. 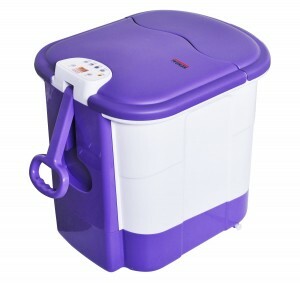 The special DuPont semiconductor used by the device makes sure that the water heats up fast, so you do not have to wait to start your therapy. The double overheating protection ensures your peace of mind, so you do not have to worry that the massager will overheat and burn your feet. The Kendal FBD2535 is made with good quality materials. The body is made of plastic that resists to high temperatures and does not wear out easily. The multi-insulation protection maintains the temperature at a comfortable level, so you can unwind and enjoy the great benefits of a foot massage for as long as you like. Massaging your feet and calves has many benefits for your health, but you may not always be in the position to pay a visit to a spa, not to mention that spas tend to be pretty expensive. The Kendal FBD2535 offers you all the advantages expected and delivered by a visit to the spa, without having you leave your home. The first benefit of this device that must be mentioned is that it greatly improves blood circulation in your lower extremities, which helps with the overall well being of the entire body. The device stimulates, through the water therapies offered, the reflex zones in your feet, which helps smoothening the meridians in your Qi system, increasing the good effects on your health. You will be able to relieve the fatigue accumulated throughout the day with great ease. Your metabolism will also improve, so you will be healthier, more relaxed and happier overall. Some of the users talk about the fact that the power cord is not long enough and an extension cord is needed in case you cannot use it close to a power socket. Others also mention that the cord is not retractable, but otherwise, those who have bought the unit seem to be very happy with it.